Since the dawn of psychology, no subject has stirred more continuous and widespread interest than the relative influence of heredity versus environment on human behavior. From philosophers to parents, most of us have speculated about which force is stronger when “Nature” and “Nurture” are thrown into the ring. This subject is equally relevant to the behavior of parrots, in that it impacts our choice of best practices with which to facilitate their full potential as companions. Speculation not withstanding, research in the fields of psychology and education strongly suggests that environment plays a highly significant role in the development of all three behavior domains: mental, social, and emotional. Experiments in the 1950s showed that baby monkeys who were raised without their parents or other nurturing caregivers stared blankly for abnormally long periods of time and rocked back and forth hugging themselves unnaturally when confronted with stressful events. Sadly, the very same pattern of behavior is reported by psychologists working with children who spent the first year of their lives without nurturing care in Romanian orphanages in the late 1980s. However, no research has been more startling or conclusive than recent findings from the field of neuroscience. 1) Learning is a biological need, and 2) the quantity and quality of early experiences affect future learning potential and social/emotional behavior. Although we are not aware of research specifically imaging the neonatal brains of parrots, generalization of the above findings is clearly justified. We can think of no characteristics specific to companion parrots that would make these two conclusions invalid. 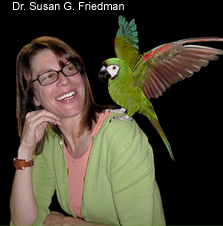 Based on the scientific data and the experiences of many people who raise successful companion birds, it is reasonable to expect that baby parrots have a similar biological need to learn and that they too are negatively affected by a lack of environmental stimulation and nurturing care during their early development. These conclusions make a compelling case for the early socialization of pet parrots. Socialization is the process by which baby birds are taught to successfully live in the human environment with humans as their primary companions. Early socialization begins at the moment the baby is removed from the nest box and continues in various forms for the rest of the bird’s life. The objective of early socialization is to teach two categories of behavior: 1) behaviors required for companionability, and 2) behaviors that ensure the bird’s comfort, health and happiness. The art of early socialization is in the ability to arrange as much overlap between the two categories as possible so that what is required is also what makes birds happy. From the earliest weeks babies should be offered brightly colored hanging toys to joust with and floor toys to beak. They should be moved to various locations to get different perspectives of the world. They should be given the opportunity to interact with other birds; play with water; step up and down; explore foods that vary in color, shape and texture; listen to music; glide to the floor; walk on flat surfaces; meet strangers; hear vacuums; beat their wings; peek out of boxes; hang upside-down from ropes; ride in baskets; somersault; feel human breath and warm hands; and see children giggling - just to name a few socialization activities. Early socialization is a purposeful, labor-intensive process in which the babies are saturated with rich experiences and delivered at the appropriate time and optimal pace for each individual bird. It requires facilitators - mentors who maximize each bird’s companionability by fulfilling their natural need to learn. The result is birds that are more trusting, confident, independent, curious, and flexible in all aspects of their lives. These recent breakthroughs in the scientific community regarding the relationship between experience and behavior offer an oasis of validation to those who suspected as much all along. Now we wonder: How much more research is needed to persuade those involved in bird mill breeding and raising of parrots that their practices are inadequate if not inhumane? People who “mill” birds typically have a particular belief system. Bird millers believe that baby birds are merchandise, goods, or wares, to be bought and sold like any other product or commodity. Consequently, they believe that their baby bird business is subject to the very same laws and practices as the business of garden hoses or toothpaste. They resent the notion that their profit motive necessarily conflicts with the humane and enriched raising of companion parrots. Bird millers provide unstimulating, unnurturing environments to the baby birds they produce. They do so because it is cost efficient, and that is, simply, their bottom line. It does not pay to do otherwise. In fact, it is so patently true that the raising of properly weaned, well-socialized babies does not yield a significant profit, it seems prudent to be wary of buying birds from people who think that it should. Another characteristic of bird mill breeders is their interest in selectively breeding the “Perfect Pet Parrot.” Certainly the practice of responsible animal husbandry is relevant to the successful breeding of companion birds. However, the “traits” often targeted for elimination by bird millers are not necessarily the result of errant genes. We believe them to be learned behaviors that are exhibited due to a lack of environmental stimulation, socialization, and nurturing care. Unfortunately, it is within the realm of possibility to selectively breed the silent cockatoo, the insensitive grey, and the still macaw, but what will be lost in the process of “de-parroting” these birds is unimaginable. The essential message is that selective breeding is not an acceptable solution for the very problem behaviors that bird mill practices create. Here is our list of “Top 10” bird mill practices to avoid when selecting the person from whom to buy your baby bird. Only one of them needs to be true for you to turn away and look elsewhere. Breeding pairs are treated as egg factories for artificial incubation. Babies are confined to small stacking brooders or cages at all times except for feeding. Babies are kept in empty cages devoid of interesting toys or other stimulation. Babies are kept in nursery rooms isolated from essential human contact and contact with each other. Babies are fed as quickly and as infrequently as possible with time-saving but unnurturing techniques such as gavage or power feeding. Babies have little or no instruction or exploration time with humans or each other. Babies are sold very young or unweaned to inexperienced pet owners with no inquiry regarding the suitability of a particular home, a particular species, or a particular baby. Little or no instruction or educational information is provided to the buyer. No after-sale care is offered or provided. The breeder talks a lot about genetically arranging the perfect pet bird. In light of our unequivocal criticism of bird mill practices, we must take care not to condemn the birds that were so raised. We must also support the people who bought their parrots during the time when there was a dearth of good, detailed information about raising, selecting, and living with companion parrots. Perhaps even more detrimental than the lack of information was the preponderance of misinformation that is now, thankfully, being corrected. Given the complexity and intelligence of parrots, it is likely that to some degree we will always be “wishing we knew then what we know now.” Surely we can improve the future of companion birds and their owners without giving up on the birds raised in the past. It is also true that some birds have beaten the bird mill odds to become fabulous companions. Their resilience may be partially due to interspecies differences, as well as individual differences within a species. Either way, it is a testimony to the parrot spirit, their nurturing families and an undeniable measure of good luck. Unfortunately, many more birds suffer the lack of early socialization by exhibiting predictable behavior deficits, such as poor physical coordination; an inability to entertain themselves with toys; narrow, unhealthy food preferences; excessive fear; unpredictable aggression; chronic biting; and incessant screaming. These can be difficult behaviors to eliminate, but even the most challenging problems may be reduced. There are now many excellent behavior consultants, Internet sites and mail lists, innovative strategies such as clicker training, and written materials to help you improve the bird mill odds. Although it is never too late for your bird to benefit from the process of socialization, the best approach is problem prevention through early socialization delivered by knowledgeable, experienced breeders. It is not the buyer's responsibility to do the work that prepares a bird for a lifetime of companionability with humans. The real decision-makers about the way baby birds will be raised are neither the bird millers nor the responsible, knowledgeable breeders. As is typical with commerce, it is the consumer who holds the power to ultimately decide. Baby birds will be raised in bird mills deprived of essential stimulation and socialization as long as we pay for birds raised this way. Alternatively, with increased awareness, we can choose to buy baby birds that are raised in ways that are consonant with the current knowledge about brain and behavior development to maximize their companionability. We are on the brink of a new dawn in psychology as neuroscience and related disciplines reveal groundbreaking information about the interaction among environment, brain structure, and behavior. Still, enough is known right now about the interaction between nature and nurture to give us confidence in our choice of best practices with which to raise successful companion parrots. Scientific evidence combined with years of experience from competent breeders validates the assertion that early socialization is the key to happy, companionable birds. This is, of course, in the best interest of the pet owners but more importantly, it is in the best interest of the birds. S.G. Friedman, Ph.D., is a faculty member in the Department of Psychology at Utah State University. She has worked with children and parents for over 25 years and teaches courses in applied behavior analysis and behavioral research methods. Her professional background, combined with her life-long love of animals, sets the stage for her current writing in the area of companion parrots. She has found that the same mentoring model that works well with children enhances the development of well-adjusted pet birds. With this model, all interactions are considered teaching opportunities, and appropriate behaviors are facilitated - never forced. Bobbi Brinker, author of the widely acclaimed book "For the Love of Greys", has been breeding and raising exotic birds for over 10 years. Her empathy for African grey parrots evolved into a theory of management based on gentle, unimposing guidance and acceptance. She is committed to providing ongoing education to parrot owners, as she believes it is the key to improving the lives of companion birds. She is the site owner of www.ParrotTalk.com and several Internet mail lists that provide a productive forum for the discussion of many species of parrots. Her articles are widely distributed nationally and internationally.